Sean Rafferty presents a mix of music and chat, with live performances from trumpeter John Wallace and The Wallace Collection, plus young saxophonist Trish Clowes. 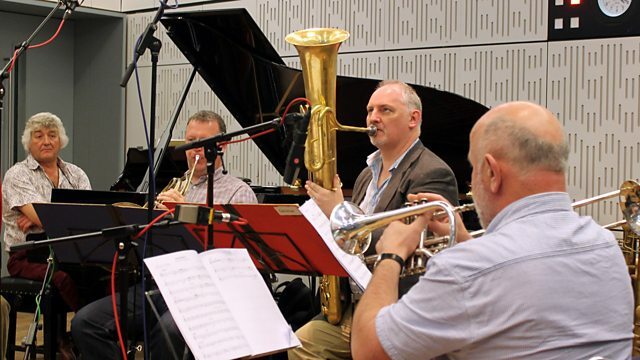 Sean Rafferty's guests include distinguished trumpeter John Wallace, celebrating his 65th birthday, and his renowned brass ensemble The Wallace Collection. They will perform live in the studio. Plus more live music from exciting young saxophonist Trish Clowes, one of the current crop of Radio 3 New Generation Artists. Main headlines are at 5pm and 6pm. Performer: Ragna Schirmer. Performer: Handel Festival Orchestra, Halle. Performer: The New Wallace Collection. Conductor: Michael Sanderling. Performer: German String Orchestra. Performer: Calum Gourlay. Performer: Chris Montague. Performer: James Maddren. Performer: Trish Clowes. Conductor: Pablo Heras‐Casado. Performer: Bavarian R S O. Conductor: George De Voil. Performer: Tim Muggeridge. Performer: Exeter College Oxford Choir. Performer: David Wilson‐Johnson. Performer: The New Wallace Collection. Conductor: Sir Simon Rattle. Performer: Berlin Philharmonic Orchestra. Performer: David Wilson‐Johnson. Performer: Simon Wright. Performer: The New Wallace Collection. Performer: Augustin Hadelich. Performer: Charles Owen. Conductor: Michel Plasson. Performer: Gino Quilico. Performer: John Aler. Performer: Toulouse Capitole Orchestra. Performer: Calum Gourlay. Performer: Chris Montague. Performer: James Maddren. Performer: Tom Lessels. Performer: Trish Clowes. Performer: Iestyn Davies. Performer: Richard Egarr. Conductor: Simon Halsey. Performer: CBSO Chorus. Conductor: Neville Marriner. Performer: Alfred Brendel. Performer: Academy of St Martin in the Fields.